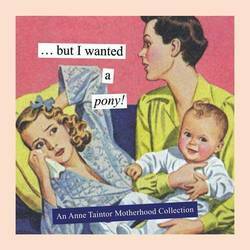 This new collection of vintage-with-a-twist work by Anne Taintor offers up a fresh serving of Anne's signature hilarious commentary on the joys, challenges, and cocktail hours of motherhood. From the fundamentals (WOW! I get to give birth AND change diapers!) to putting food on the table (you see them as pies . . . I see them as cries for help) to dealing with childhood questions (because I'm the mother . . . that's why) and strategies for taking the edge off (now be a dear and fetch mommy her flask), Taintor expertly captures the funny, frantic, and honest thoughts that most moms have experienced, with an attitude mothers everywhere will welcome. Anne Taintor and her daughter apply current, slightly twisted captions to vintage magazine clippings from the 40s and 50s. Her magnets and journals and many other products featuring these designs are in distribution at stores throughout the world. She also has personal care products with BlueQ and paper napkins and tissues with Paper Products Design.